Author F Scott Fitzgerald's handwritten records of his life and career have been made available to fans and scholars after being put online. 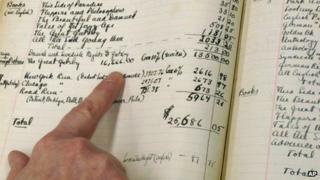 The Great Gatsby author kept records of his publications, income and key events in a ledger, which has been put online by the University of South Carolina. They show he made $2,000 from The Great Gatsby when it was published in 1925. But income from the book increased, with a payment of $16,666 for film rights made the following year. The records have been made available to coincide with the latest big-screen version of the book - a film directed by Baz Luhrmann and starring Leonardo DiCaprio is released in May and is opening Cannes Film Festival. Park Bucker, an associate English professor at the university, told the Associated Press news agency that the ledger "may be a unique artefact among American authors". "This is going to be an amazing thing for students to pore over and dip into," he said. "He created his own database. We do it on computers now, but he did it for himself." The ledger begins in 1919 and covers the period until 1938. He died in 1940. The document is divided into five sections - a record of published fiction, money earned by writing, published miscellany (including movies), the earnings of wife Zelda and a year-by-year account of his life. The autobiographical section begins with his birth in 1896. Of February 1900, he wrote, referring to himself: "He celebrated the new century by swallowing a penny and catching the measles. He got rid of both of them." By his 20s, his yearly round-ups lamented how his life was "full of terrible failures and acute miseries" (in 1923). When he was 36, in 1932, it was "a strange year of work & drink. Increasingly unhappy". "This is a record of everything Fitzgerald wrote, and what he did with it, in his own hand," said Elizabeth Sudduth, director of the Ernest F Hollings Library at the University of South Carolina. "We know he didn't spell very well," she said. "And his arithmetic wasn't much better." Why is The Great Gatsby back?